An easy glazed salmon recipe perfect for fall. Preheat oven to 375 degrees F. Line a baking sheet with parchment paper and arrange salmon fillet portions skin-side down on the pan. In a small saucepan or skillet, whisk together bourbon, maple syrup, brown sugar, lemon juice, and a pinch of salt and pepper. Bring to a low simmer and cook, stirring occasionally, until glaze has thickened to a light syrup consistency, about 5-10 minutes. Reserve about 1/2 the glaze for topping the cooked salmon, and brush the remaining half of the glaze over the salmon fillets with a pastry brush. Bake salmon at 375 degrees F for 12-15 minutes until cooked through. When salmon is cooked, use a clean pastry brush to to fish with the remaining bourbon glaze. In a small bowl, whisk together Greek yogurt, olive oil, lemon juice, mustard, salt and pepper to form your slaw dressing. Set aside. In a large bowl, toss together shredded fennel, shredded apples, and chopped parsley. Slowly stream dressing into the fennel apple mixture, adding just a bit of dressing at a time and tossing thoroughly in between each addition. You may not need all of the dressing – use just enough to lightly coat the fennel and apples! Save extra dressing for salads or another batch of slaw. 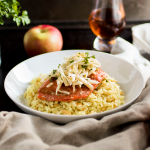 Top each salmon fillet with a generous helping of apple fennel slaw and serve immediately. I served this salmon over rice pilaf, but you can serve it with rice, pasta, potatoes, roasted veggies, or a salad – whatever you feel like! You may need to adjust the cooking time based on the size of your salmon fillets and your preferred level of doneness. Use your best judgment! The bourbon glaze is a lot of fun, but if you’re in a hurry, you can skip the glaze and bake the salmon with just a drizzle of olive oil and maple syrup and a pinch of salt and pepper. It will still taste great with the slaw! This glaze is very sweet, which complements the tartness and brightness of the slaw. If are NOT serving the slaw and the glazed salmon together (or if you just don’t like sweet flavors), you may want to adjust the recipe or try something like this mustard roasted salmon instead. Not a fennel person? Use shredded green cabbage instead. Serve this salmon and slaw with rice pilaf, mashed potatoes, or on top of a crisp salad. This slaw would also be delicious with my maple dijon chicken!